Slowly but surely we're seeing Wireless-N Wi-Fi become more established in the marketplace, and it's a good sign to see Netgear refreshing their line. Their new WNR2000 ($89) is a standard N router and the DGN2000 ($119) is the same router with a built-in DSL modem. Both systems feature Netgear's password-less Push 'N' Connect service along with more expensive kit bundle options that include a USB Wireless-N dongle to upgrade older systems. And both units are available now. Read on for the full press release version of what we just said. NETGEAR Family of New Energy-Efficient Wireless-N Routers, Modem Routers and Kits Makes It Even Easier to Upgrade Wireless Networks and Computers to High Performance Wireless-N The Wireless-N Router (WNR2000) and Wireless-N Modem Router (DGN2000) include NETGEAR's Smart Wizard(TM) installation CD for quick and easy installation. Once the routers are installed, NETGEAR's Push 'N' Connect with Wi-Fi Protected Setup (WPS) eliminates the need to remember network security passwords by enabling users to securely connect computers to the router with the simple press of a button. Both the Wireless-N Router and Wireless-N Modem Router incorporate eco-friendly "NETGEAR Green" features including packaging manufactured using at least 80 percent recycled materials, Energy Star(R)-qualified power supplies, and an on/off switch to help save energy when the network is not in use. A conveniently accessible on/off switch on the Wireless-N Modem Router (DGN2000) enables users to turn off just the wireless mode as well. "The growing number of home-based productivity and entertainment applications running over the home network infrastructure is now exceeding the capabilities of older Wireless-G (802.11g-based) routers and modem routers," stated Som Pal Choudhury, NETGEAR's senior product line manager for advanced wireless products. "The enhanced wireless speeds and greater coverage provided by Wireless-N technology enables the simultaneous use of applications such as voice-over-IP, video and multimedia streaming, console gaming, and Web surfing. The launch of these new Wireless-N networking solutions makes it easier and more affordable for consumers to replace their existing routers or modem routers and upgrade their WiFi networks to support these more bandwidth-intensive applications. The new product family is feature-rich in terms of performance capabilities and ease of use as well as energy-efficiency." 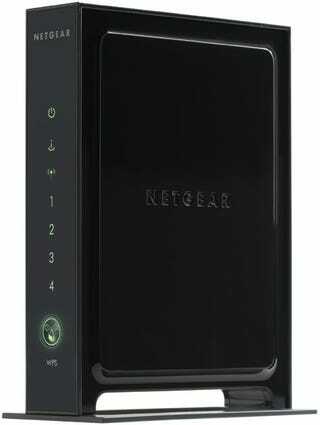 In addition to the Wireless-N Router and Wireless-N Modem Router, which enable users to affordably upgrade their networks to simultaneously support both new Wireless-N devices and legacy Wireless-G devices, NETGEAR also announced the availability of networking kits that package a Wireless-N USB Adapter with each of the new routers. The Wireless-N Router and USB Adapter Kit (WNB2100) and Wireless-N Modem Router and USB Adapter Kit (DGNB2100) enable users to upgrade their computers at the same time as their home networks to support the high performance and long ranges provided by Wireless-N technology. The Wireless-N Modem Router (DGN2000) incorporates an ADSL2+ modem enabling users to upgrade existing DSL equipment and eliminate the need for an external modem. In the U.S., it is fully compatible with Verizon, AT&T, Qwest(R), EarthLink(R), and other DSL Internet service providers. With multiple SSID support in the Wireless-N Modem Router, creating a unique SSID and security for guest access is now possible without needing to share the user's own security code. Mr. Choudhury continued, "These new products boast many of the features, performance, ease of use and 'green' attributes comparable to the highest-end routers and gateways, while still being very affordable. Our Wireless-N Router and Modem Router are not only fully backward-compatible with legacy 802.11b/g devices, but the USB adapter included in the networking kits also enables users to upgrade their existing computer to enjoy the performance of Wireless-N at a fraction of the cost of buying a new notebook with Wireless-N." About the NETGEAR Wireless-N Router (WNR2000) and Wireless-N Router with Built-In DSL Modem (DGN2000) The NETGEAR Wireless-N Router (WNR2000) and Wireless-N Router with Built-In DSL Modem (DGN2000) deliver the highest wireless performance and longest ranges to support today's Wireless-N notebooks and adapters while providing simultaneous support for legacy 802.11g devices. The Wireless-N Router with Built-In DSL Modem incorporates an ADSL2+ modem enabling users to easily and seamlessly upgrade existing equipment provided by DSL Internet service providers. The WNR2000 and DGN2000 both incorporate efficient Energy Star-qualified power supplies and feature an on/off switch to save energy when the network is not in use. The NETGEAR Wireless-N Router (WNR2000) and Wireless-N Router with Built-In DSL Modem (DGN2000) enable users to quickly and easily establish a secure network with a robust security feature set that includes: double firewall (NAT and SPI), Denial-of-Service (DoS) attack protection, Intrusion Detection and Prevention (IDS), WiFi Protected Access(TM) (WPA2-PSK, WPA-PSK), Wired Equivalent Privacy (WEP), Wireless Access Control to identify authorized wireless network devices, and Wi-Fi Protected Setup(TM) (WPS) for push-button connection of network devices. The Wireless-N Router (WNR2000) and Wireless-N Router with Built-In DSL Modem (DGN2000) are backed by a one-year warranty and 24/7 technical support. Both are available worldwide via leading retailers, direct marketers, e-commerce sites, and value-added resellers at retail prices in the U.S. of $89 and $119, respectively. About the Wireless-N Router and USB Adapter Kit (WNB2100) and Wireless-N Modem Router and USB Adapter Kit (DGNB2100) The NETGEAR Wireless-N Router and USB Adapter Kit (WNB2100) and Wireless-N Modem Router and USB Adapter Kit (DGNB2100) package the RangeMax(TM) Wireless-N USB 2.0 Adapter (WN111) with the NETGEAR Wireless-N Router (WNR2000) and Wireless-N Router with Built-In DSL Modem (DGN2000). The two Kits enable users to upgrade their home networks and a computer to enjoy the high wireless speeds and extended ranges delivered by Wireless-N technology. Designed to deliver superior performance and range, the Kits incorporate the NETGEAR Push 'N' Connect button to easily establish a secure connection between the USB adapter and the router with the simple push of a button. The NETGEAR Wireless-N Router and USB Adapter Kit (WNB2100) and Wireless-N Modem Router and USB Adapter Kit (DGNB2100) are backed by a one-year warranty and 24/7 technical support. The Wireless-N Modem Router and USB Adapter Kit (DGNB2100) is available in Europe and Asia, while the Wireless-N Router and USB Adapter Kit (WNB2100) is available worldwide via leading retailers, direct marketers, e-commerce sites, and value-added resellers at a retail price in the U.S. of $129.